They said it took various attempts to come up with this cookie. I would love to know how they made it. Until then, I can't wait till we go back so I can have that cookie again. Special thanks to BJ and SS for sending me the picture! 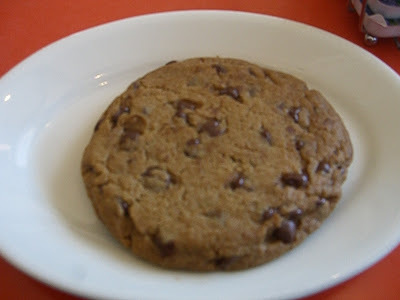 Vegan Chocolate Chip cookies I found on chooseveg.com. I haven't tried it yet...hopefully it is yummy. Let me know! *Earth Balance can be found at Whole Foods, Lakeshore Natural Foods, and other natural health food stores. **ENER-G Egg Replacer is a brand-name powder mixture of vegetable starches that simulates eggs in baking. It can be used in recipes calling for unbeaten eggs, egg whites beaten stiff, and egg yolks. It can be found at Whole Foods as well as natural health food stores. 1. Combine flour, baking soda and salt in small bowl. 2. Beat butter, granulated sugar, brown sugar and vanilla in large mixer bowl. 3. Add egg replacer one at a time, beating well after each addition; gradually beat in flour mixture. 4. Stir in chips and nuts. 5. Drop by rounded tablespoon onto ungreased baking sheets. 6. Bake in preheated 375-degree oven for 8 to 10 minutes or until golden brown.